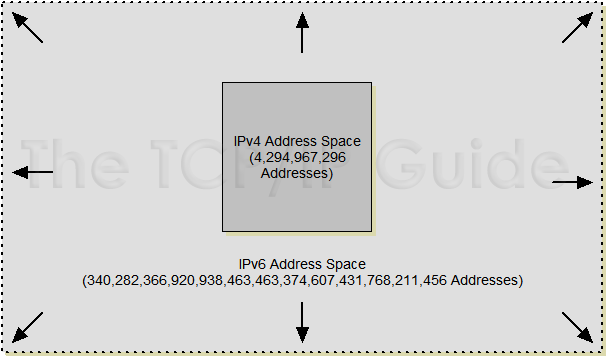 The 128 bits of IPv6 addresses mean the size of the IPv6 address space is, quite literally, astronomical; like the numbers that describe the number of stars in a galaxy or the distance to the furthest pulsars, the number of addresses that can be supported in IPv6 is mind-boggling. See Figure 94 for an idea of what I mean by astronomical. It's enough addresses for many trillions of addresses to be assigned to every human being on the planet. The earth is about 4.5 billion years old. If we had been assigning IPv6 addresses at a rate of 1 billion per second since the earth was formed, we would have by now used up less than one trillionth of the address space. The earth's surface area is about 510 trillion square meters. If a typical computer has a footprint of about a tenth of a square meter, we would have to stack computers 10 billion high blanketing the entire surface of the earth to use up that same trillionth of the address space. Okay, I think you get the idea. It's clear that one goal of the decision to go to 128-bit addresses is to make sure that we will never run out of address space again, and it seems quite likely that this will be the case.